About 2 weeks ago now I used up another one of my google offer purchases. Woot! I love actually using them and not letting them go to waste. A google offer is much like a groupon deal. The deal is for a product or service in your area where you get 30-60% off. The most recent deal I used up was for Benessere Olive Oils and Vinegars where I bought a $10 voucher for $23 worth of goodies from their store. They have a location in downtown Portland that has been open a couple of years and they just opened a new location in the southeast of Portland. I made a date with myself and walked the almost mile to check out the downtown store. It was a beautiful day much like the weather we’ve had since then. As I was approaching Benessere I wondered if it would be the type of store where even with my voucher, I’d have to pay extra just to walk out with one bottle of olive oil. Not the case. The above selection cost a total of $24 ($10 from the voucher and $14 paid in the store) and if I didn’t have any voucher it would have been a $37 purchase. Granted I probably wouldn’t spend $37 on a regular day but if I had just walked in off the street, I would have bought ONE bottle of something. Their prices are reasonable for the quality, volume, and wide variety of choices compared with big chain grocery stores. 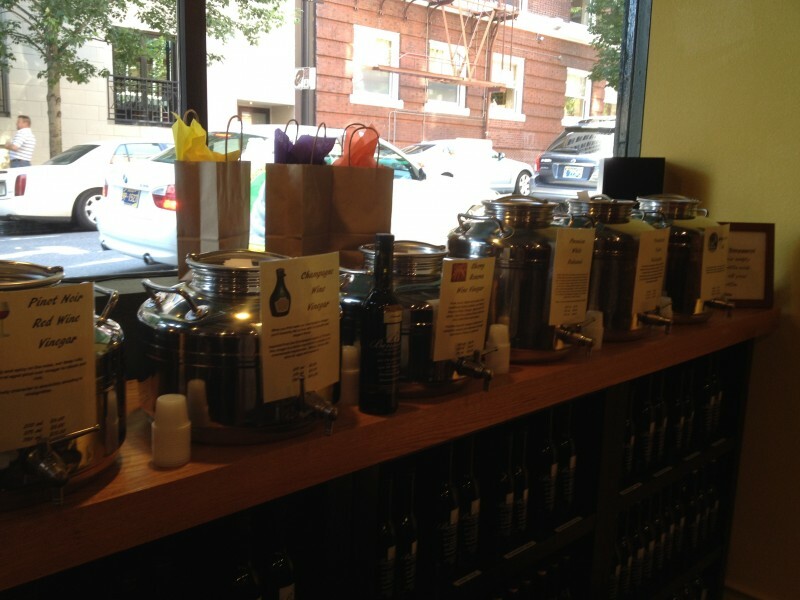 I’ve been to one other olive oil ‘bar’ and that was in Geneva, Illinois, in each of these stores one could walk around and sample ALL of the casked oils and vinegars. There are little plastic cups where you can pour 1/2 teaspoon up to probably 1/2 an ounce. I tried probably 3 olive oils and went for the one with the strongest olive flavor and sampled 4 or 5 vinegars and went with 3 – oh my! The vinegars I sampled didn’t even make a dent in the selection that they had available. There were so many recipe and dressing concoctions that could be had that it would make your head swim. 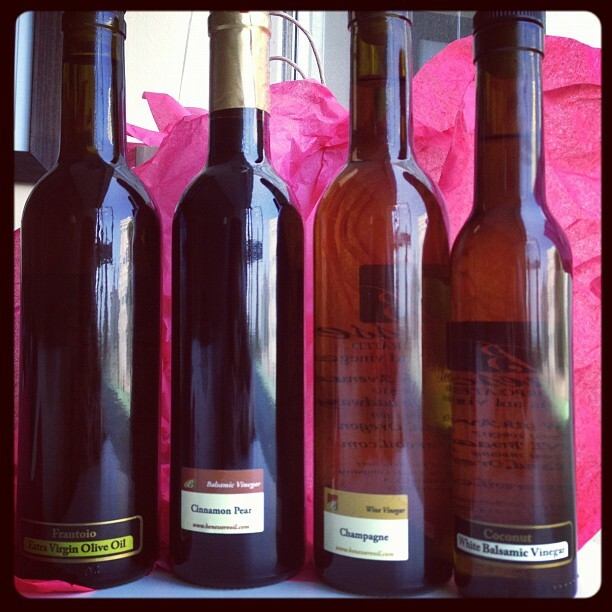 My favorite vinegars turned out to be a cinnamon pear balsamic, white champagne vinegar, and a coconut white balsamic. The cinnamon pear is beyond heavenly. It absolutely has the effect of biting into a cinnamon sprinkled pear without being too overpowering. 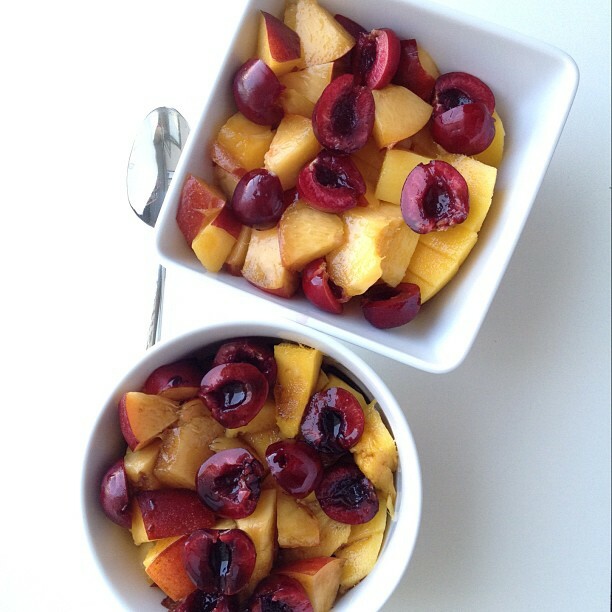 I served this over fresh cut mangoes, peaches, and cherries and believe it would also be great over banana ‘ice cream’ or regular ice cream. I’ve been interested in buying a champagne vinegar for a long time now as I would love to try my hand at a homemade raw champagne dressing made with cashews or avocados. One of my favorite dressings used to be Girard’s lite champagne dressing, though I feel they changed their formula from sugar to high fructose corn syrup so I stopped buying it some time ago. It has a delicious flavor with big chunks of cracked pepper to spice it up a bit. So stay tuned. The coconut vinegar gets the vote for the strange but new to me category. In the last couple years I’ve grown to love everything coconut related – natural flavor of course – and thought this would be great with sesame oil for an easy salad or dinner stir fry. If you ever do go into a store like this, you must try their 18+ year balsamic. I didn’t sample Benessere’s but the store I went to years ago in Geneva, I still remember that it was thick like pancake syrup and sweet with almost no hint of vinegar flavor, just a touch. I could hardly believe it was vinegar and that they were suggesting I serve it over ice cream for dessert. At Benessere, their 18 year was no more expensive than many of the other vinegars. 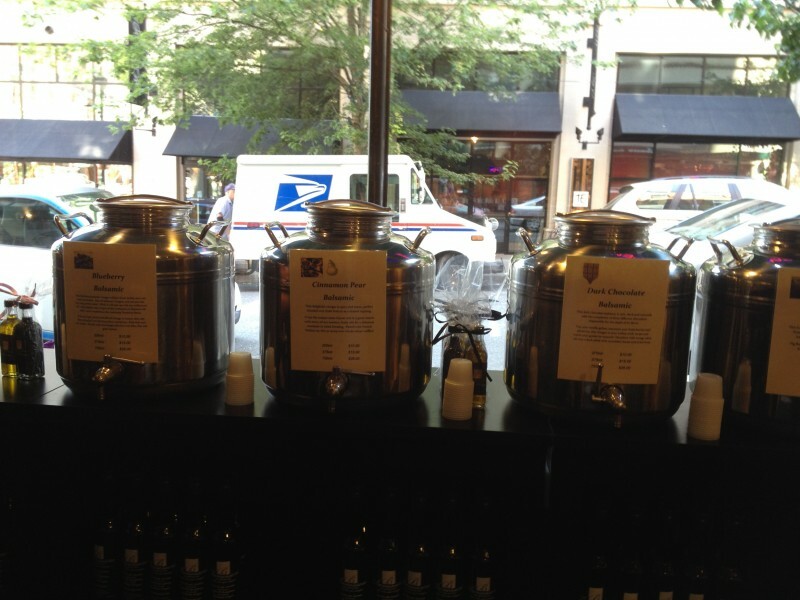 Have you been to an olive oil ‘bar’?